This Allan Holdsworth lesson will look at three chord voicings and show how you can take them through a scale and use them to make a great varied comp over a modal D dorian background. I will also talk about how you can use the different textures or sounds that the different chord voicings create to have more options available while comping. The main example here below is using all three types of chords that i will cover here. For each line in the example I have a different type of voicings moving from very spread to more and more closed chord voicings. No Allan Holdsworth lesson would be complete with out this type of chord! 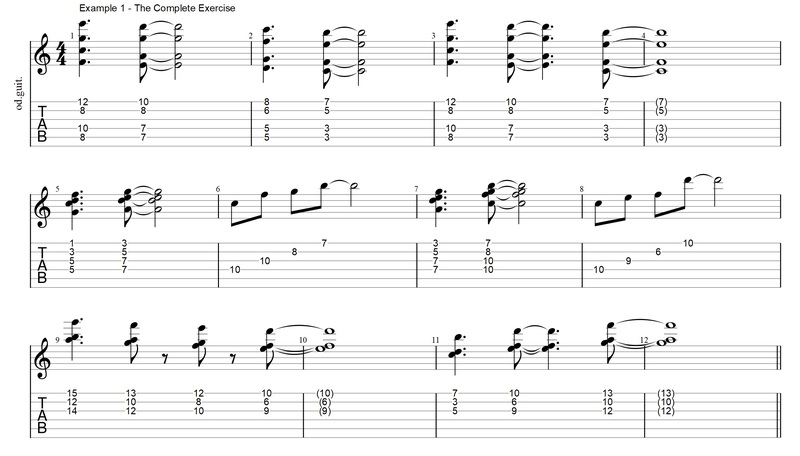 The first type is a chord that i have talked about before in the Allan Holdsworth lessons. It is a structure that is very common to Holdsworths music and you can see it as being a quintal arpeggio with an added note or as derived from Drop2&4. When creating the scale exercise here below I focus on using sounds that are either directly a Dm7,Dm13 or Dm6 or at least neuatral so a sort of Am or Em7 voicing. The Am and Em chords will easily work as diatonic passing chords in the context and if sound more vague that directly like another chord. With the 2nd type of chords we have a closed version of the above material. These voicings are for the biggest part completely like the ones above, except that these can actually be voice-lead through the scale and still work as a combination of neutral or Dm. These can be a bit difficult to play so you have to be a bit careful and make sure you are warmed up before you start working on them. The basic construction is a diatonic 7sus4 chords. In Jazz it is common to have passages of comping that are harmonized melodies. The previous voicings in this lesson are a bit tricky to move around too much. When Allan does this (using this type of voicing in 0274 off Sixteen Men Of Tain) he goes for another type of voicing. In other songs he also uses triads (who would have thought). It is worth noticing that there are not many straight drop2 voicings, simply because this would not really fit with the sound and the harmony of his music. In this example the voicing is a 2nd interval and a 7th interval from the lowest note. This structure is not very clear but does have a great sound with the combinations of intervals in there. Creating different textures by using different voicing types. As you can see these voicings work very well in a D dorian context and you can easily move them around and create some great sounds. Switching between different types of voicings is a great way to get more sounds to pull from when comping. This is really something important to check out since we often forget that and just connect the same types of chords all the time. In that respect there is something jazz guitarists can really learn from this Allan Holdsworth lesson. This entry was posted in Blog, Lesson on February 15, 2018 by jens.